In a small saucepan, gently warm the milk over low heat until it registers 110° on an instant-read thermometer, 3 to 5 minutes. In the bowl of a stand mixer fitted with the dough hook, mix the flour with the baking powder and salt. Whisk the egg into the warm milk and add to the bowl with the flour. Mix on medium speed until the dough starts to pull away from the side of the bowl, 3 minutes. Transfer to a work surface and knead into a ball. Rub the dough all over with oil and transfer to a lightly oiled large bowl. Cover with plastic wrap and let rest for at least 4 hours, or refrigerate overnight. Preheat the oven to 375°. Set a rack over a rimmed baking sheet and arrange the bacon on the rack in a single layer. Bake until browned and crisp, about 25 minutes. Drain the bacon on paper towels and let cool completely. Finely chop and transfer to a medium bowl. Stir in the cheese and crushed red pepper. Increase the oven temperature to 500° and set 2 large cast-iron skillets on the center rack while preheating. Meanwhile, divide the dough into nine 3-ounce balls and cover with a damp kitchen towel. On a lightly floured work surface, use your fingertips to press 1 ball of dough into a 5-inch round, leaving it thicker in the center (it should look like a filled ravioli). Press a scant 1/4 cup of the bacon-cheddar filling into the center of the dough, then pull the edge of the dough up and over the filling to form a ball; press the seams together to seal. Place the ball seam side down and flatten gently with your palm. Using a lightly floured rolling pin, roll out the ball to form a 6-inch round. Repeat with the remaining dough and filling. 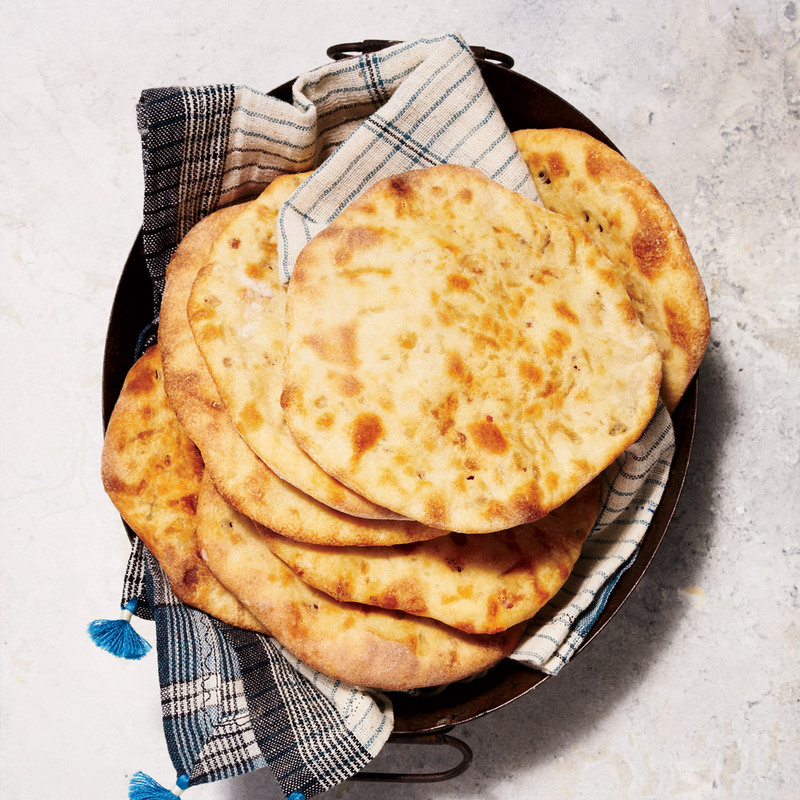 Working in batches, bake the naan in the hot skillets until slightly puffed and golden, 5 to 7 minutes per batch. Brush with melted butter and serve warm. The filling and the dough can be refrigerated separately overnight. Review Body: Incredible taste on this flatbread!! Review Body: I was skeptical about the use of baking powder instead of yeast in this recipe (would love to hear from Chef about the choice). Clearly with a four-hour rest time, it wasn't a choice made to save time. Nonetheless, I followed the directions, except that I used less filling than directed (maybe half as much, with the exception of the chili flakes, where I used the full amount). FANTASTIC nonetheless. My wife and I cook during big snow storms and this was a great way to spend part of a snow day (or in this case, the day after a snowy day). Probably, we won't make this a regular part of our cooking rotation but it's a great special occasion dish.